The Holy War between Microsoft Corporation and Sun Microsystems is heating up as Sun unveils JAX Pack to compete with Microsoft's .NET initiative JAX Pack is an all-in-one development kit that utilizes XML to build cross platform Web services. For companies that are developing Web services to collaborate with business partners, JAX Pack offers a faster way to develop applications while maintaining independence from any particular vendor's XML technologies. 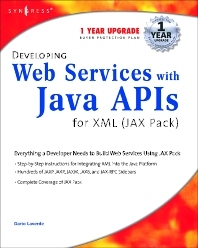 Developing Web Services with Java APIs for XML (JAX Pack) provides exhaustive coverage of Sun's recently released JAX Pack. The book assumes that readers are experienced Java developers with a solid understanding of XML. As such, the book contains five parts covering each component of JAX Pack.